It’s about Shepherd Drive, but go and ask why they support the project to destroy Buffalo Bayou. Don’t forget the public meeting tonight (Wednesday, July 30, 2014) with City Council Members Oliver Pennington (District G) and Ellen Cohen (District C), who represent the wild banks of Buffalo Bayou to be bulldozed by the misguided project known as the Memorial Park Demonstration Project. Even the natives and the early settlers (including mill owners) knew better than to cut down the riparian forest on Buffalo Bayou, recognizing its importance for naturally controlling erosion of the banks, slowing storm waters, filtering pollution and bacteria, trapping sediment, and providing wildlife habitat. 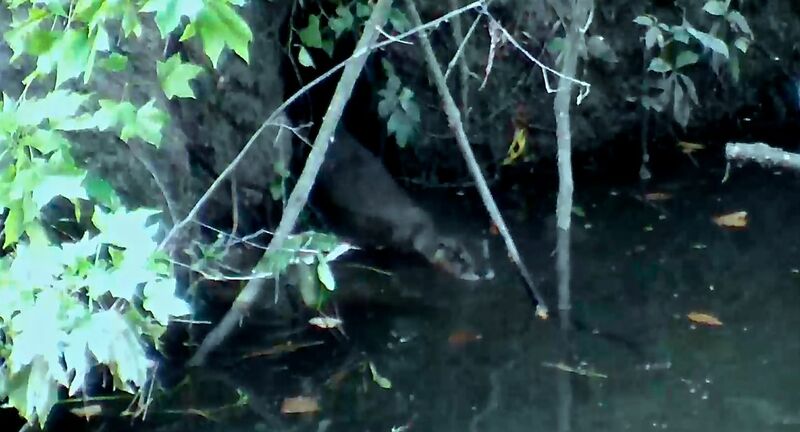 Otter emerging from its den on a tributary of Buffalo Bayou. Photo courtesy of Dewey Stringer. Cohen represents Memorial Park, which belongs to all of us. And Pennington, who is running for mayor, represents the south bank of the project, owned by the River Oaks Country Club, stewards of the riparian forest for which it is named since 1923. Pennington also represents that little-known section of Memorial Park just west of 610, now known as the Bayou Woodlands, formerly the Archery Range. There, just off Woodway, a failing “erosion control” project is spewing mud and silt into the bayou. Previously this was a lovely forested ravine with a nature trail. The TIRZ 16, encompassing the Galleria area, now including Memorial Park, and a special kind of improvement district that gets to keep and spend tax money that would have gone into the city treasury, spent $1,147,934 on this particular drainage boondoggle designed by engineering firm AECOM, which also designed the failing “erosion control” project on the banks of the Houston Country Club. So go and ask these city council members why they support the destruction of some of the last best, healthiest and most beautiful bayou we have in the city. The project would destroy nearly 1.5 miles of the bayou, including most of the forest on both banks, dredging up and rechanneling our lovely, shady stream, obliterating creeks and prehistoric bluffs too old even to contemplate, killing and driving away wildlife, trampling and removing habitat, and so much more that is wrong. The Army Corps of Engineers is considering whether to issue a permit for the project. The meeting, held in conjunction with the city Public Works and Engineering Department, is from 6 to 7:30 p.m. at St. Anne’s Catholic Church (St. Basil’s Hall), 2140 Westheimer Road. The purpose is to review a paving and drainage project, set to begin in a few weeks, on Shepherd Drive from Westheimer to Buffalo Bayou. So it’s not exactly about the bayou project. But there will be a question and answer period. Here are the Top Ten Reasons they give for destroying the bayou and how to answer. Read the rest of the article in the online edition of the Houston Chronicle. Note: This article also appeared in the print edition of the Chronicle on Sunday, August 3, 2014, Page G4. Do be aware that not everyone on the BPA board nor every member of the BPA supports this ugly boondoggle, which would channelize one of the last remaining stretches of natural bayou left in the city, change the course of the bayou, excavate and fill in the banks, and obliterate magnificent cliffs, lovely creeks, and tributaries. It would replace the shady, wild banks with sun-baked Bermuda grass. Wildlife habitat would be eliminated. A representative of AECOM is on the board of the BPA as well as a representative of KBR, the engineering contractor for the Buffalo Bayou project and a major donor to the BPA (along with the Harris County Flood Control District). Also on the BPA board are two property owners (Mike Garver and Terri Thomas) out of the half dozen or so private property owners whose property is to be “restored” by the $4 million taxpayer-funded portion of the $6 million HCFCD project. A major BPA donor (Michael Dishberger) is also a property owner benefiting from the public project. 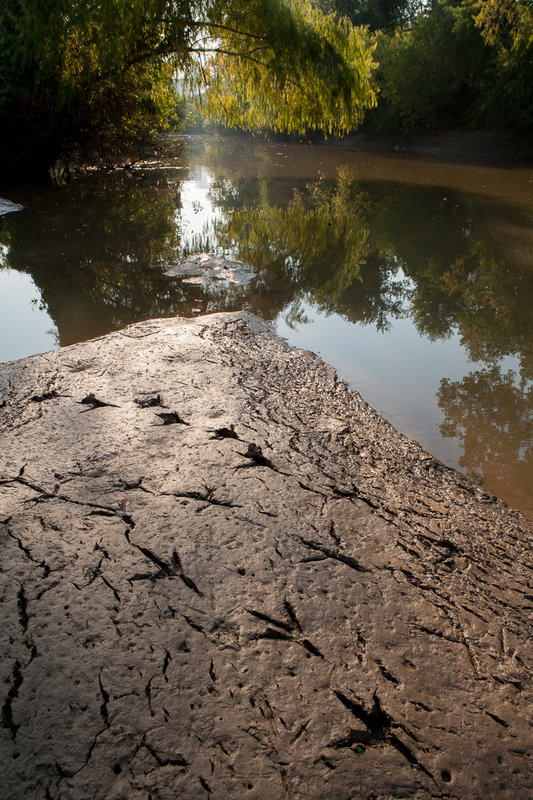 The BPA’s natural, sympathetic, holistic plan to help Buffalo Bayou be all it wants to be. Mathias Kondolf is one of the world’s leading river scientists. 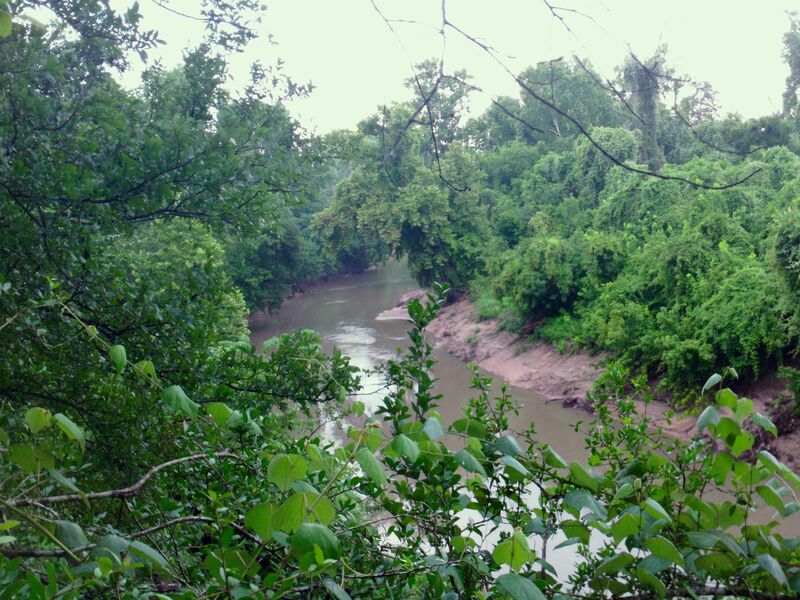 He recently wrote a letter to the Army Corps of Engineers recommending that the corps deny Harris County a permit to bulldoze the wild banks of Buffalo Bayou in and around Memorial Park. The $6 million project would remove most of the riparian buffer from nearly 1.5 miles of some of the last remaining stretch of natural bayou in our city, demonstrating to landowners up and down the bayou and elsewhere the exact wrong thing to do. By far the most beautiful and healthiest stretch of the bayou, as it flows past Memorial Park and the Hogg Bird Sanctuary this shady, slow-moving wild bayou belongs to all of us. And amazingly, it is right here in the middle of our big city. 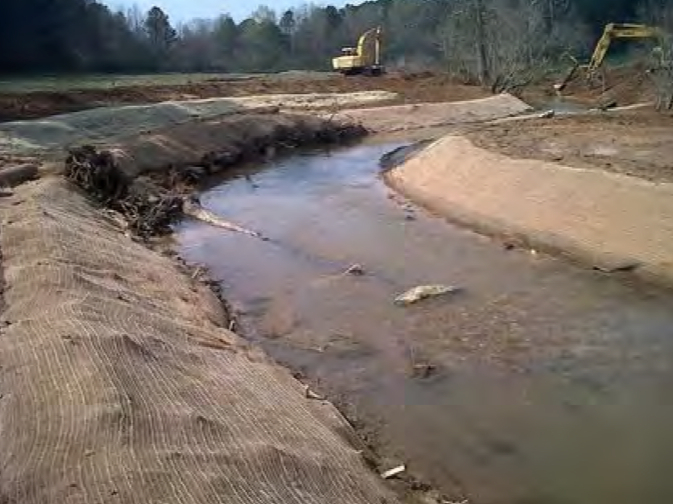 Kondolf points out that the existing riparian habitat is of “high quality,” that the erosion rate of the banks in the target area as estimated by the county is “not really problematic,” and notes that the construction project itself would likely dump three times more sediment into the waterway than this area does in a year. Read Mathias Kondolf’s letter to the Army Corps of Engineers. The forested banks of Buffalo Bayou as it flows past Memorial Park, on the left, and the River Oaks Country Club, on the right. All this would be razed by the Bayou Preservation Association’s plan to “restore” the bayou. Photo taken July 13, 2014. Kayaked down Buffalo Bayou past Memorial Park the other day with geophysicist Richard Hyde, a longtime supporter of Buffalo Bayou, an early member of the Bayou Preservation Association, and an opponent of the BPA’s very bad plan to destroy the natural beauty of Buffalo Bayou in order to … well, no one can quite figure out the purpose of this bizarre and heart-breaking project that would raze over a mile of perfectly fine riparian forest along both banks in and around our great Memorial Park. The proposal, created and promoted by the BPA and officially a project of the Harris County Flood Control District, would also dig up and fill in the bayou, its banks and high bluffs, dam up or bulldoze tributaries, causing enormous loss of land and forest to the River Oaks Country Club, which is paying $2 million for the privilege. It is a mystery why anyone thinks this is a good idea; a mystery how a project with no public benefit and so much public harm ever got funded ($4 million from county and city taxpayers); and a mystery why the BPA, an organization founded to “preserve the natural beauty” of the bayou, would be so hell-bent on eradicating it. The water was very low — known as base flow, the bayou’s natural flow during fair weather, which is very slow and shallow. Except it wasn’t really base flow because a thunderstorm had just passed over, so even as we were slip-sliding in under the Woodway bridge the water was rising and the current picking up from runoff. Our first shocking encounter was the new Woodway drainage outfall, recently constructed at a cost of $1,147,934 to Houston taxpayers (i.e. taxes that went to the Galleria area TIRZ 16 rather than into the city treasury). Laughably, this project, no longer under construction but still closed to the public, is described as an “erosion control” project in the TIRZ 16-Uptown 2013-2017 Capital Improvement Plan. “This drainage outflow project is to mitigate erosion in banks of Buffalo Bayou at Woodway,” says the budget description. 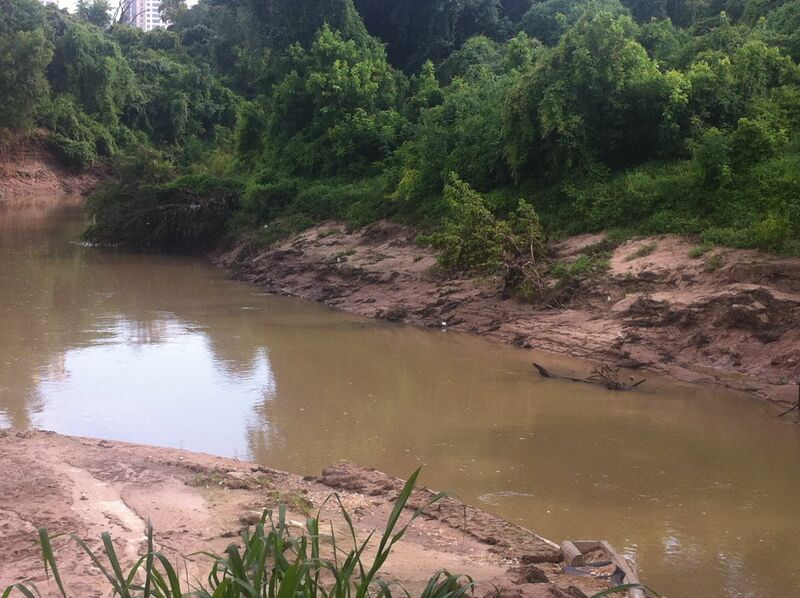 Photo taken July 15, 2014, of mud and sand eroding from sides of new drainage outfall at Woodway on Buffalo Bayou. The budget shows no funds allocated for operating and maintenance. The big, new drainage pipe was also supposed to be set at an angle that allowed the often powerful flow of water to be released in the direction of the flow of the bayou, instead of shooting directly at the opposite bank. But apparently someone forgot to tell that to AECOM, the engineers who designed the project (as well as the tragically unsuccessful “erosion control” project at the Houston Country Club, which razed much of the riparian forest buffer on the banks of Buffalo Bayou along its golf course). AECOM designed the Woodway outfall so that the water blasts directly at the opposite bank, which is already being eaten away by the force. 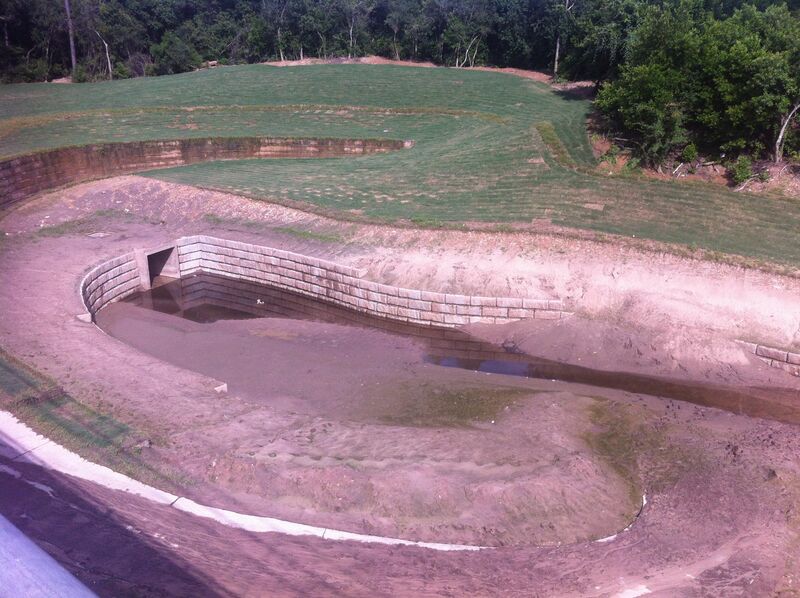 The big new outfall shoots storm water directly at the opposite bank and sediment into the bayou. Oops. Maybe “erosion control” means “increasing erosion”? Mr. Hyde just shook his head. This “erosion control” project is in City Council Member Oliver Pennington’s district and Mr. Pennington is running for mayor, as he tells everyone he meets, so be sure to let him know what you think about Mr. Pennington’s “erosion control.” He’s holding a public meeting on Wednesday, July 30, 2014, from 6:00 to 7:30 pm at St. Anne’s Catholic Church, St. Basil’s Hall, 2140 Westheimer (at the corner of Shepherd). The meeting is to discuss “storm drainage improvements” on Shepherd from Westheimer to Buffalo Bayou. The project is scheduled to begin in a few weeks and will last over a year, so it’s very kind of Mr. Pennington to offer a public meeting about it. Mr. Pennington supports the “erosion control” project that requires razing the wild banks and destroying our natural bayou in and around Memorial Park. So let him know what you think about that too. Might be time to bring out the pitchforks pickets and banners. The period is now closed for public comment to the Army Corps of Engineers on the application from the Harris County Flood Control District to bulldoze the wild banks of Buffalo Bayou in and around Memorial Park. The fight for the life of our beautiful southern bayou grows stronger. We must continue to raise awareness about this little known project, educate our friends and neighbors about the senseless destruction that is planned, and try to change the minds of our politicians and civic leaders. See What To Do Now. The Army Corps received numerous comments opposing the project from experts in the field and ordinary citizens who cherish access to this unique treasure in the middle of our city. Among other things, the project violates state (pdf) and federal policy (pdf) protecting riparian buffer on our waterways.